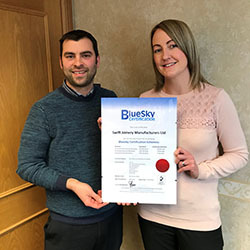 Swift Joinery Manufacturers Ltd has switched to the Bluesky Certification General Performance Windows and Doors, and Enhanced Security Windows and Doors that meet the requirement for the Secured by Design Scheme. “Switching to Bluesky Certification is really easy,” says Louisa Roberts, Sales Coordinator at Swift Joinery Manufacturers, manufacturers of timber windows and external doors. “A lot of the work we do is for commercial projects, so having all the relevant certification in place is important for our customers. The switchover process was a paperwork exercise which Simon Beer and the team at Bluesky Certification made painless. They managed the whole process for us. 2018 has started well for the Yorkshire-based joiners. Swift Joinery Manufacturers has recently expanded its premises to give extra capacity and there is lots in the pipeline. The work Swift Joinery Manufacturers does is varied – as well as working on large-scale new build and heritage projects, the team work very closely with architects over the UK on some very grand homes. More recently, Swift Joinery Manufacturers has been working on some interesting industrial units in Leeds, as part of an extensive refurbishment to create city centre flats.